Kasha is a type of cereal or porridge made from buckwheat groats which have first been roasted, then soaked and finally slowly simmered until soft. Roasting the groats brings out strong, nutty flavors, and cooked kasha has a firm texture and slightly gummy consistency. Kasha is a common dish in Eastern Europe, and kasha varnishkes is a traditional Jewish preparation that combines cooked kasha with bowtie pasta and onions. While kasha does usually refer to a cereal or porridge made from buckwheat groats, the word is occasionally used in some parts of the world to refer to any porridge made from any whole grain, including wheat, barley, millet, and oats. 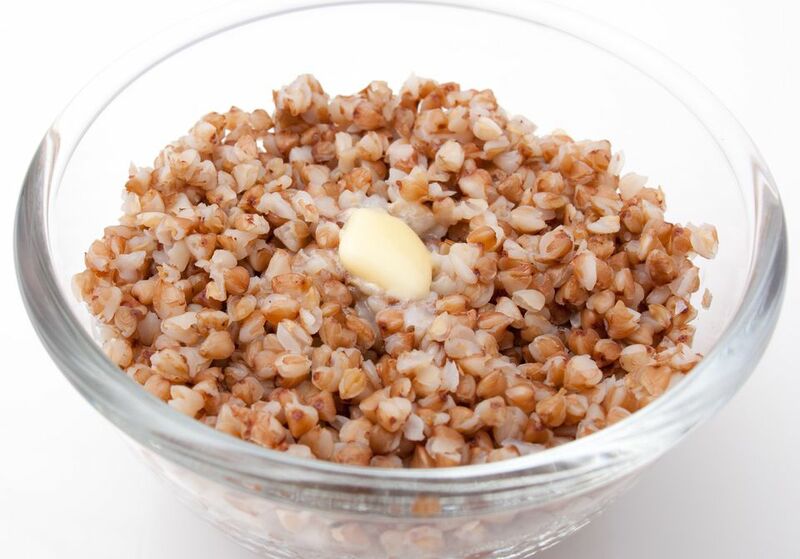 In the United States, however, the word kasha refers to buckwheat groats. Interestingly enough, buckwheat is not a true grain but rather a seed, though it can be prepared like a grain. It shares this characteristic with wild rice, which is not a type of rice but in fact a seed, as well as quinoa. One of the most common problems people have when cooking kasha is that it can sometimes turn out mushy, which means it's been overcooked. The best way to avoid this is to use no more than 1½ cups of liquid for each cup of uncooked kasha. You might even need less liquid than that. Another thing is that, even though it's cooked like rice, it cooks much more quickly than rice. You don't need to cook it for more than 6 to 7 minutes. Finally, even though it has the word "wheat" in its name, buckwheat isn't related to wheat, and so kasha is a gluten-free food. Because it is such a staple among Eastern Euopeans as well as North American Jews, even to this day, kasha is a food that can be served both as a savory dish and a sweet one. Savory kasha is prepared seasoned with salt and flavored with butter. Cooking it in chicken stock is another common technique, and in addition to butter, chicken fat can be used to add flavor and moisture. Modern cooks serve it with grated cheese, and it can also be used as an ingredient in soups like split pea soup, for instance, as well as a component in salads. Ground to a somewhat finer consistency, it can also be prepared as a dish similar to polenta, using buckwheat groats rather than corn. Indeed, it can also be mixed with coarsely ground cornmeal and cooked in chicken or vegetable stock, along with garlic, herbs, olive oil and topped with a hard grated cheese like Parmesan or Asiago. Sweet kasha is likewise a traditional preparation, both as a breakfast cereal and a dessert porridge or pudding. In this case the kasha is cooked in milk rather than water or stock, and seasoned with both salt and sugar. Brown sugar, molasses or maple syrup are alternate choices for sweetening kasha, and with the addition of raisins or fresh berries, as well as nuts or roasted pumpkin seeds, it can make a wholesome and nutritious breakfast "cereal." Are Chickpeas the Same as Garbanzo Beans? What Are Groats and How Are They Used? What Do You Use Fennel For? What Kind of Food Is Goulash? What Is a Barnsley Chop?